Hello soon-to-be twelfth grader! Are you thinking about that personal statement your colleges of choice are asking you to write? Perfect timing— but don’t wait too long! Get started this summer. In this workshop, you’ll try your hand at a variety of application topics, explore the role of style (not just what you say but how you say it), and analyze sample personal statements. You’ll draft, share, revise, edit. 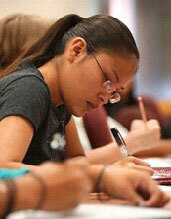 After the three-day summer session, you’ll have two months to choose your colleges, find out what their essay topics are, and begin to write. Optional 45-minute one-on-one conferences in October 2019.